As somebody who likes to bet on football online, I have gotten used to using e wallets. They are the best way to move your money about online. 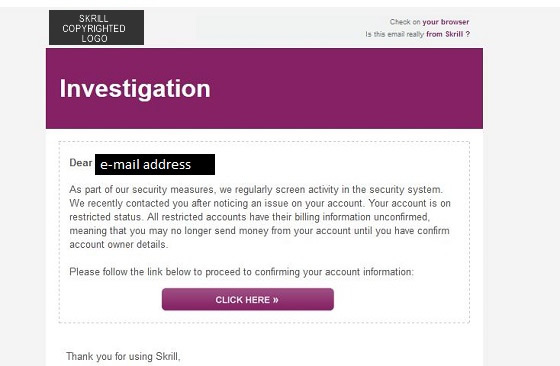 In the last few days I have been getting some very legit looking phishing emails. I have been betting online for years so I am a little more savvy to someone not used to using them. The emails I received could easily catch you out. There basic idea is to get you to click the link. Doing so will bring you to a site that looks just like the wallet mentioned in the mail. You enter your details because you think it real, and bang they have access to your account and any funds in there. Check out the images below to see how good these mails look. Notice that they look legit and from skrill or moneybookers. Now when an online wallet you have an account with want to get intouch with you, they will never call you Dear Official or Dear Email Address. And they will not send you email after email like this. They will ALWAYS use your real name. Pay close attention to the email addresses below. 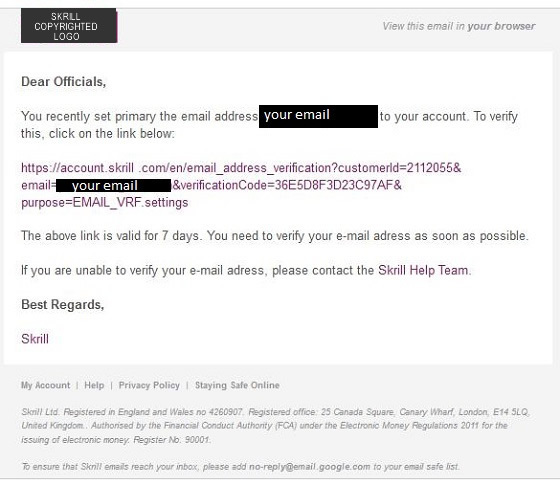 You will see if you are not paying attention they look to be legit, especially the skrill..com and moneysbookers. You have to be careful with these. Treat these like they are as important as your bank account. Some tips to keep you safe when shopping or betting online. They will never call you by your email, they always use your real name. Make a private email that you use only for the wallet nothing else. No Nigerian tribal prince or president will ever want to put $10,000,000 in your account. This unfortunately one of the problems with using online wallets, but if you be careful and keep things private you should never have a problem. I personally use Neteller. I use it for everything online. With them you can order a master card that you can use once you have funds on there. I have it linked to paypal for when I want to buy from ebay and I use it for shopping, restaurants you name it. You can link your bank account to it and top it up by as little as $20. I know this is safe because I have the card in my hand like a bank card. It has a pin like a bank card. To log into the site you need an account number, pass number, security questions, not just an email like other sites. Everybody who bets or shops online should have one. Just remember the tips, keep the account details private. Make one email address and use it just for Neteller nothing else. Do that and you will be fine.